Sloppy Lentils - A Vegan Sloppy Joe Recipe from Oh My Veggies! And then he called me Andy Rooney under his breath. But I think we all know that I have several years to go before my eyebrows reach that kind of plush luxuriousness. Soooo, hey! Lentils! Lentils are something I have absolutely no complaints about. If I were Herbert Hoover, I would make sure there was a bag of lentils in every pot in this fine country. (Look at me, using my degree in history!) When I was a new and new-ish vegetarian, I was all about meat substitutes, but as I’ve gotten more comfortable with this whole vegetarian cooking thing, I’ve almost entirely ditched them in favor of whole foods like lentils. Lentils are cheap and easy (in a good way! ), they’re tasty, and they are quick to make! Not as quick as popping some faux-nuggets or faux-wings in the microwave, but quicker than beans, which require advance soaking. Lentils don’t need soaking! Just throw them in a pot with some water or broth and about 20 minutes later, they’re done. 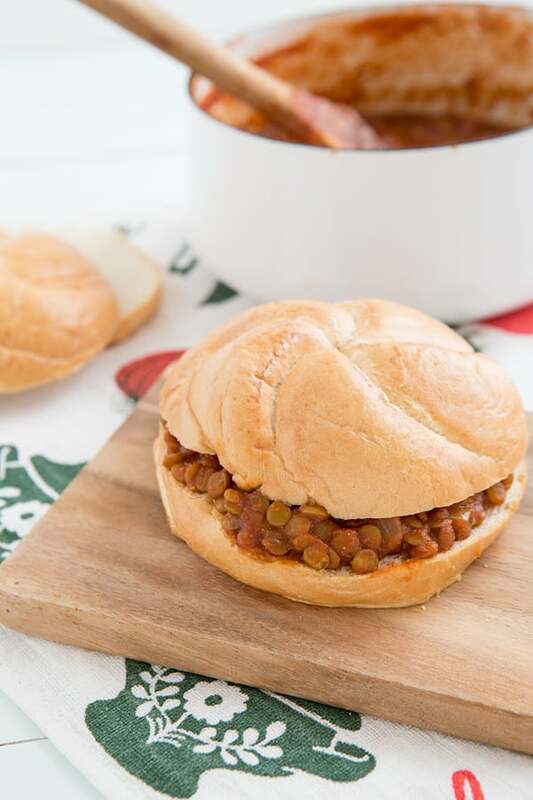 These Sloppy Lentils make a tasty vegetarian sandwich, but they’re great as a side dish too! Heat the oil in a large saucepan over medium heat. Add the onion and cook until softened and just beginning to brown, 5-7 minutes. Add the lentils and broth; bring to a boil, then partially cover and reduce heat to low. Simmer for 20 minutes, or until the lentils are tender enough to eat, but still firm enough to hold their shape (not mushy!). Stir in the tomato sauce, brown sugar, molasses, vinegar, tamari, tomato paste, garlic powder, mustard powder, and cayenne. Increase the heat to medium and bring to a boil. Continue to cook the lentils until the sauce has thickened, 10-15 minutes more, stirring frequently. 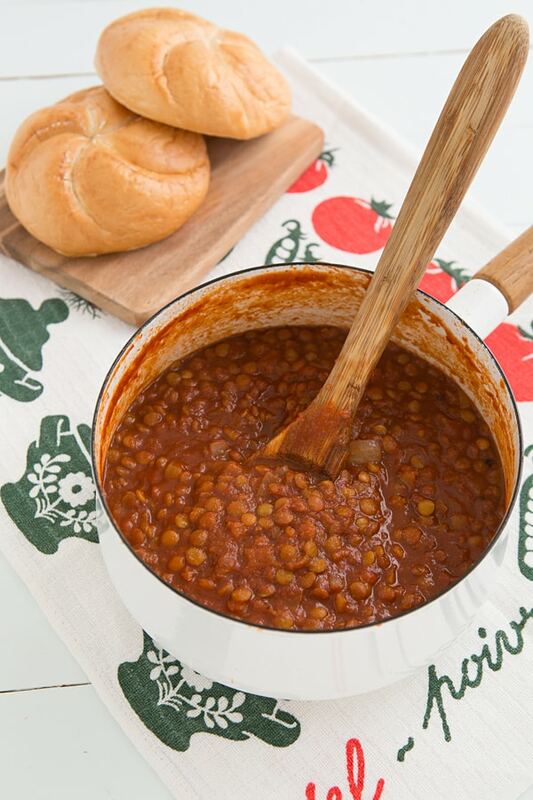 Serve the lentils on the rolls if you’re making sandwiches. I love lentils and I think they are totally under-rated. This recipe sounds fantastic. This sounds really good! I didn’t think I would like lentils until my mom made me taste homemade lentil burgers (the real kind, not stuffed with weird stuff) and it was really good! Lentils deserve more praise and you did them well! Yeah, lentils don’t get a lot of love for some reason. I guess it’s because alone, they’re pretty meh. But you can use them in so many different ways! I’m totally with you on the hashtag thing. I can’t understand what is so difficult about it. And for the longest time, people were hashtagging all over Facebook when it was only for Twitter. UGH! And now they accept it, but people just use it randomly – no rhyme or reason. Lol! Pretty sure my blood pressure just went up thinking about this! 🙂 Oh! I just heard on the Today Show the other day that ‘hashtag’ is in the top 3 most disliked words of 2013! My kids LOVE both sloppy joes and baked beans – so I’m totally making this! Love your sauce recipe – and that everything is already in my pantry! Yay!!! YES! I knew someone who used to hashtag everything on Facebook before Facebook legitimized hashtags and I wanted to be like “GAH! STOP IT!” I get emails with hashtags, and it makes me want to scream. If you put hashtags in emails, you don’t understand hashtags! But I think this is the librarian/taxonimist in me–hashtags were originally for categorizing things and tracking topics, and now I think they’re often just used for emphasis, and that bothers me. Hmph. 🙂 And, congratulations. You’ve made me hungry for lentils. And I don’t really like lentils. What’s wrong with chasing kids off your lawn with a broom? 😉 This looks great! And easy. I despise faux nuggets (or maybe I was just offered an awful brand once), but I’m all behind lentils. I made this last Saturday for lunch for my students taking a full day sugar class. They have come to expect great veggie meals from me and this was a huge hit. Sunday I had it over some pasta. Today? Maybe just on it’s own with a salad. I love your recipes. Made this item last night! It was DELICIOUS. I can’t wait to get home and have leftovers for dinner. Followed the recipe to the T.
I’ve been wanting to make a good version of sloppy joes with lentils! I tried doing an Indian version of sloppy joes with mixed vegetables once but it was just okay (kind of lacking in flavour). I like the sounds of this recipe though, it sounds like it would have lots of layers of flavour! Yum, been dreaming about these since you posted it and just made it. I added a little more brown sugar, I like my Sloppy Lentils/Joes sweet. Oh and a little Heintz Chili Sauce. Great recipe. Thanks! I like them sweet too! 🙂 I’m glad you enjoyed the recipe. I was sold before you said a cross between sloppy joes and baked beans, but now I am so on board this train! Also, I am nearly 100% sure I use hashtags wrong, which I would also like to credit to my age. Oh to be young and cool again.. but alas I just sit here in my fleece PJs on the weekend and try to figure out how Facebook works, thinking about delicious lentil dishes I should make this week. I hope you liked them! 🙂 And a very belated Merry Christmas to you too! I came across this recipe on Pinterest. I’ve made it a couple times now, and oh my it’s so yummy! The only thing I do differently is add coconut sugar instead of brown sugar, and way more garlic powder and cayenne pepper than the recipe calls for.. I also add some squirts of siriarcha, because I love spicy! 5 stars from me! I love spicy too! Adding sriracha sounds good to me–maybe I will try that next time. 🙂 I’m glad you enjoyed the recipe! Just made these for my carnivore husband and he loved it! Yay! This is definitely going into our rotation on meatless Mondays! Thanks for the recipe! Thank you for your comment–I’m so glad to hear it was a hit! Do you think you could put this in the crockpot? If so what heat and for how long? I tried making this in my slow cooker and it didn’t work out–the lentils didn’t soften enough. If you did want to give it a try, I’d suggest cooking the lentils first, then combining them with the sauce ingredients and putting them in your crockpot. I haven’t tried it like that myself, but I can say for sure that using uncooked lentils will not work. wow! i made this tonight and it was fantastic. my kids and husband all loved it! thanks for a great veggie alternative to sloppy joes! Thanks for your comment – I’m glad the recipe was a hit! I made this last night (with some alterations to make it sugar free) and it was so YUM! My husband and I both loved it! (we aren’t vegetarians either). Delicious! Thanks for your comment – I’m glad you and your husband enjoyed the recipe! I just made this to share at a potluck. It’s great! So glad I came across this on Pinterest! I made these for dinner tonight on homemade buns, and it was SO GOOD! One of the first wedding presents we received was a slow cooker. I saw that you recommended against using one, but I was just dying to use it. It was a smashing success! I omitted the olive oil and used a pinch of red pepper flakes instead of cayenne (spicy and I don’t get along well). I just tossed all of the ingredients into the slow cooker and cooked it on high for 3.5 hours, stirring occasionally. I also recently moved to Denver—maybe the elevation has something to do with cooking the lentils all the way? I’m not sure, I’m still figuring this high altitude stuff out.